Four college football bowl games will span more than 12 hours on Saturday, starting with the Birmingham Bowl and ending in Hawaii. Bettors will have plenty of odds and point-spread options throughout the day, but one game in particular is catching the attention of both Pros and Joes. Four college football bowl games will span more than 12 hours on Saturday, starting with the Birmingham Bowl and ending in Hawaii. Bettors will have plenty of odds and point-spread options throughout the day, but one game in particular is catching the attention of both Pros and Joes. Westgate LV SuperBook oddsmaker Jeff Sherman told BetChicago sharp bettors are laying the points with Army in the Armed Forces Bowl vs. Houston from the opening number of Houston -3 all the way to Army -5, but the Cougars are seeing some buy-back to 4.5. __Also read:__ [Picks against the spread for Saturday's bowl games](https://www.betchicago.com/college-football-bowl-picks-saturday-dec-22-hawaii-la-tech) It's easy to see why bettors love Army in this spot. Houston will be without starting quarterback D'Eriq King, star defensive tackle Ed Oliver and starting corner Isaiah Johnson. Houston already had one of the worst rush defenses in the country and now will face Army's triple-option attack that ranks No. 1 in time of possession and is No. 2 in stuff rate. Houston has allowed 34 rushing TDs this season, 4.2 yards per carry (6.0+ over last 5 games) and an average of 34.4 points per game. Against run-first Memphis in Week 13, Houston lost 52-31 as a 9.5-point underdog and was out-gained 610-394 (401 rushing yards allowed). Houston will have freshman QB Clayton Tune calling the shots for the nation's No. 2 unit in tempo, but how often the Cougars get the ball will be the difference in the game. Army ranks No. 1 in time of possession and has had four games this season in which it had the ball for 40-plus minutes, including a 28-21 OT loss to No. 4 Oklahoma. Elsewhere in college football bowl games on Saturday, Sherman said sharp bettors are backing host Hawaii at pick 'em in the Hawaii Bowl vs. Louisiana Tech (pushing the spread to -1 as of Thursday), Troy at +2.5 in the Dollar General Bowl vs. Buffalo (down to +1.5), but the Westgate has also seen action on Buffalo at -1.5. # 2018 college football bowl game odds for Saturday, Dec. 22 ## Birmingham Bowl betting lines, odds and prediction ### Memphis vs. Wake Forest 11 a.m. CT Saturday, Dec. 22 in Birmingham, Ala. on ESPN __Point spread:__ Memphis -3.5 __Total:__ 73 __Betting line movement and games notes:__ With two powerful offenses and weak defenses, it's no surprise the total is over 70 points, but the number has actually come down after opening at 75. Memphis star RB Darrell Henderson is out, but the Tigers have another 1,000-yard rusher in Patrick Taylor Jr. to pick up the slack. Wake's star WR Greg Dortch's status is in doubt with a finger injury, and the Demon Decons would certainly be at a disadvantage if he is unable to go. <a href="https://twitter.com/PFF_College/status/1075084030226386945" class="embedly-card" data-card-width="100%" data-card-controls="0">Embedded content: https://twitter.com/PFF_College/status/1075084030226386945</a> __S&P+ prediction:__ Memphis 39, Wake Forest 27 ### Memphis betting records, stats 2018 SU record: 8-5 2018 ATS record: 8-5 2018 O/U record: 8-5 S&P+ rank: 23 Off. S&P+ rank: 8 Def. S&P+ rank: 75 Special Teams S&P+ rank: 28 __Note:__ S&P+ rankings are an advanced data set of tempo- and opponent-adjusted components of the five factors of college football: Efficiency, explosiveness, field position and finishing drives. Per creator Bill Connelly, a fifth factor, turnovers, is informed marginally by sack rates. __Play and win:__ [Join our free contests](https://betchicago.chalkline.com/) ### Wake Forest betting records, stats 2018 SU record: 6-6 2018 ATS record: 4-8 2018 O/U record: 7-5 S&P+ rank: 77 Off. S&P+ rank: 56 Def. S&P+ rank: 78 Special Teams S&P+ rank: 72 ## Memphis vs. Wake Forest, Birmingham Bowl betting trends Demon Deacons are 0-6 ATS in their last six games following a straight up win and are 4-10 ATS in their last 14 games overall. Tigers are 5-0 ATS in their last five games as a favorite but are 1-5 ATS in their last six bowl games. OVER is 10-1 in Tigers' last 11 non-conference games. 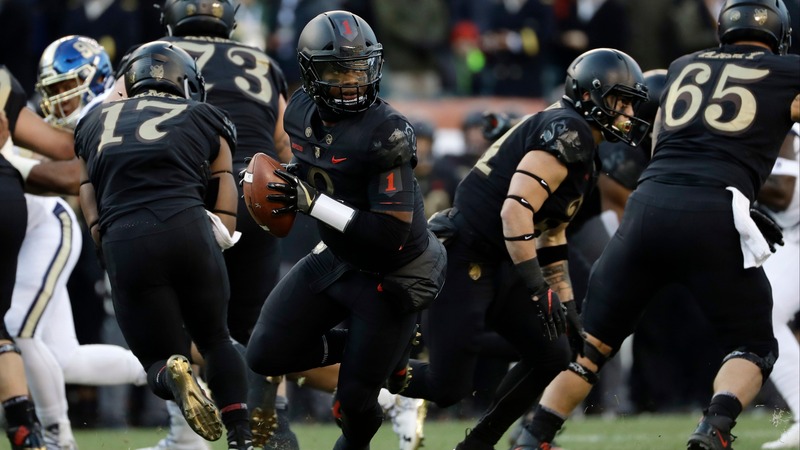 ## Armed Forces Bowl betting lines, odds and prediction ### Houston vs. Army 2:30 p.m. CT Saturday, Dec. 22 on ESPN in Fort Worth, Tex. __Point spread:__ Army -5 __Total:__ 60 __Betting line movement and games notes:__ Bettors like Army and the UNDER. The total opened at 67.5 at the Westgate but has come crashing down to 60 as of Thursday's writing. UNDER has historically been a good bet with Army, going 23-8 in its last 31 vs. a team with a winning record. S&P+ has a different opinion, however. __S&P+ prediction:__ Houston 37, Army 29 ### Houston betting records, stats 2018 SU record: 8-4 2018 ATS record: 6-6 2018 O/U record: 8-4 S&P+ rank: 41 Off. S&P+ rank: 11 Def. S&P+ rank: 100 Special Teams S&P+ rank: 42 ### Army betting records, stats 2018 SU record: 10-2 2018 ATS record: 6-4 2018 O/U record: 6-6 S&P+ rank: 83 Off. S&P+ rank: 52 Def. S&P+ rank: 77 Special Teams S&P+ rank: 123 ## Houston vs. Army, Armed Forces Bowl betting trends Knights are 6-0-1 ATS vs. a team with a winning record. Cougars are 1-4 ATS vs. a team with a winning record. OVER is 8-1 in Cougars' last nine games as an underdog of 3.5-10.0. ## Dollar General Bowl betting lines, odds and prediction ### Buffalo vs. Troy 6 p.m. CT Saturday, Dec. 22 on ESPN in Mobile, Ala. __Point spread:__ Buffalo -1.5 __Total:__ 49.5 __Betting line movement and games notes:__ Off a heartbreaking collapse against NIU in the MAC title game, Buffalo faces another tough defense in Troy, which ranks 14th in sack rate. Getting pressure on the inaccurate arm of Bulls QB Tyree Jackson (completing 55 percent of his passes) will be key to the Trojans' chances. At a huge disadvantage in special teams, Buffalo opened as a 3-point favorite at the Westgate, but the spread, along with the total, has shrunk. __S&P+ prediction:__ Troy 29, Buffalo 27 ### Buffalo betting records, stats 2018 SU record: 10-3 2018 ATS record: 9-4 2018 O/U record: 9-4 S&P+ rank: 51 Off. S&P+ rank: 32 Def. S&P+ rank: 57 Special Teams S&P+ rank: 124 ### Troy betting records, stats 2018 SU record: 9-3 2018 ATS record: 8-3-1 2018 O/U record: 7-5 S&P+ rank: 46 Off. S&P+ rank: 82 Def. S&P+ rank: 35 Special Teams S&P+ rank: 11 ## Buffalo vs. Troy, Dollar General Bowl betting trends Trojans are 8-1-1 ATS in their last 10 games following a ATS win. Bulls are 3-10-2 ATS in their last 15 games as a favorite of 0.5-3.0. Troy is 9-3-1 ATS as underdog since 2015. ## Hawaii Bowl betting lines, odds and prediction ### Hawaii vs. Louisiana Tech 9:30 p.m. CT Saturday, Dec. 22 on ESPN in Honolulu __Point spread:__ Hawaii -1 __Total:__ 62 __Betting line movement and games notes:__ Hawaii opened as a 2-point favorite at the Westgate and dropped to a pick 'em before the aforementioned sharp action took the Warriors back to -1. The island could prove to be a distraction for Louisiana Tech leading up to the game, but the Bulldogs are 4-0 SU and 3-1 ATS in bowl games under Skip Holtz the past four seasons. Hawaii has covered one game since Oct. 8. __S&P+ prediction:__ Louisiana Tech 31, Hawaii 29 ### Hawaii betting records, stats 2018 SU record: 8-5 2018 ATS record: 5-7-1 2018 O/U record: 8-5 S&P+ rank: 100 Off. S&P+ rank: 50 Def. S&P+ rank: 118 Special Teams S&P+ rank: 86 ### Louisiana Tech betting records, stats 2018 SU record: 7-5 2018 ATS record: 6-6 2018 O/U record: 4-8 S&P+ rank: 95 Off. S&P+ rank: 109 Def. S&P+ rank: 47 Special Teams S&P+ rank: 115 ## Hawaii vs. Louisiana Tech, Hawaii Bowl betting trends Hawaii is 3-4 ATS at home this season but is just 6-13-1 on the island since coach Nick Rolovich took over in 2016. LA Tech is 9-4 ATS in its last 13 away from home and Holtz is 17-6 ATS as an underdog since 2014.